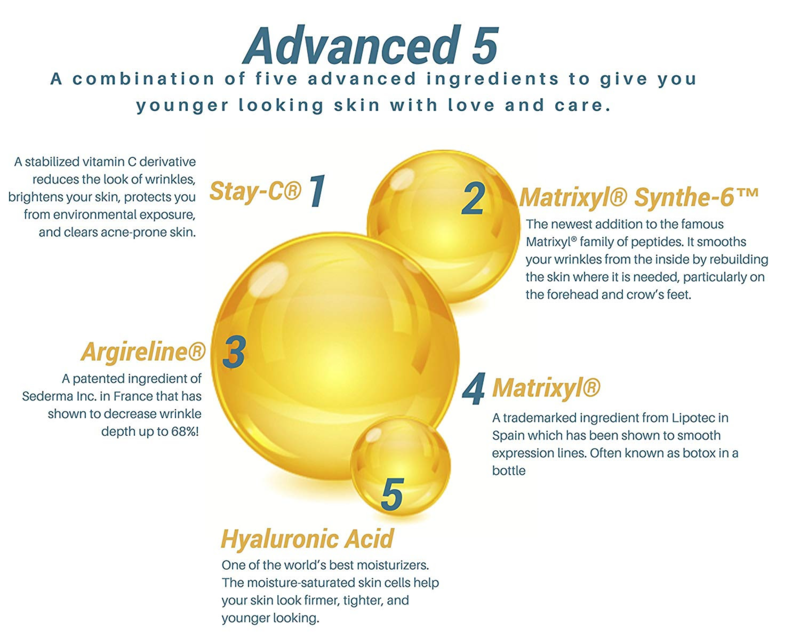 VANISH DARK CIRCLES & PUFFINESS EYE TREATMENT WITH ADVANCED 5 (STAY-C, HYALURONIC ACID, MATRIXYL, MATRIXYL SYNTHE-6, ARGIRELINE WORK IN COMBINATION TO LIGHTEN DARK CIRCLES, REDUCE PUFFINESS AND DIMINISH FINE LINES! THIS FORMULA IS ALSO HAS APPLE STEM CELLS EXTRACTED FROM A RARE SWISS APPLE THAT STIMULATE COLLAGEN. VANISH DARK CIRCLES & PUFFINESS EYE TREATMENT WITH ADVANCED 5 COMBINES THE MOST ADVANCED PEPTIDE COMBINATION ON THE MARKET. THE AGE-DEFYING SERUM IS A VITAMIN C SERUM, A HYALURONIC ACID SERUM AND A TRI-PEPTIDE SERUM ALL IN ONE PRODUCT! OUR FORMULA CONTAINS A COMBINATION OF CERTIFIED ORGANIC EXTRACTS, PROVIDING A CERTIFIED ORGANCE PRODUCT OF OVER 70% THE USE THIS ADVANCED COMPLEX SERUM WILL TREAT THE EYE AREA FOR DARK CIRCLES, CROW'S FEET, AND PUFFINESS! Stay-C® IS A STABILIZED VITAMIN C DERIVATIVE (SODIUM ASCORBYL PHOSPHATE) WITH MANY DOCUMENTED SKIN BENEFITS INDLUDING REDUCING THE LOOK OF WRINKLES, SKIN BRIGHTENING, PROTECTION FROM ENVIRONMENTAL EXPOSURE, AND CLEARING ACNE-PRONE SKIN. Hyaluronic Acid IS ONE OF THE WORLD'S BEST MOISTURIZERS. AS SKIN AGES, IT LOSES ITS ABILITY TO HOLD WATER. THESE MOISTURE-SATURATED SKIN CELLS HELP YOUR SKIN LOOK MORE PLUMP, FIRMER, TIGHTER AND YOUNGER LOOKING. Matrixyl® Synthe-6™ IS THE NEWEST ADDITION TO THE FAMOUS MATRIXYL® FAMILY OF PEPTIDES. IT ACTS AS A WRINKLE FILLER, BY SMOOTHING WRINKLES FROM THE INSIDE BY REBUILDING THE SKIN WHERE IT IS NEEDED, PARTICULARLY ON THE FOREHEAD AND CROW'S FEET. IN SPAIN WHICH HAS BEEN SHOWN TO SMOOTH EXPRESSION LINES. OVERALL, THIS AMAZING TREATMENT EYE SERUM IS PACKED WITH THE MOST ADVANCED INGREDIENTS AVAILABLE FOR MORE YOUTHFUL LOOKING SKIN WITHOUT IRRITATION, NEEDLES, OR SURGERY.